In 2004 the PCC made the brave decision that we should try and re-hang the 5 bells at All Saints. They had not been rung properly for over 100 years because the wooden ringing gear and frame had become decayed and unsafe. Fundraising started and we were fortunate that many individuals and grant making bodies contributed to the project including a generous grant of £2000 made by the Essex Heritage Trust. In total a sum of £55,000 was raised to enable the project to be undertaken. The first stage began in December 2007 when local people helped the bell founders, Hayward Mills, to remove the 5 historic bells from the tower and transport them to Nottingham where the old wooden headstocks were removed and new metal ones fitted. 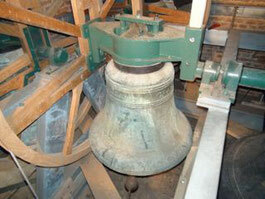 The bells are very historic and have now been listed. 4 were cast in 1628 by Miles Graye of Colchester. 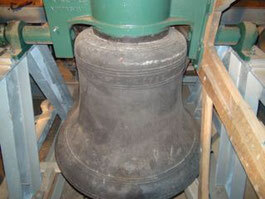 The 5th bell (the tenor) was recast by Richard Phelps at Whitechapel in 1732. The bells are unusual because they have remained virtually untouched since they were first hung. They are tonally quite good for their age and because of their significance they have been re-hung without tuning (a process that involves shaving metal off the inside of the bell to alter its note). The work in the bell tower progressed during 2008 with the building of a new ringing floor and wooden stairs and preservation of the old wooden bell frame. 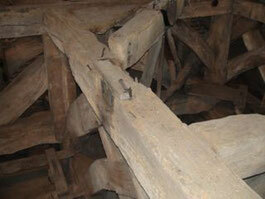 The new metal bell frame has been fixed lower in the tower to help provide additional strength to the brick tower. The restored bells were finally returned in September 2008 and re-hung with new ringing gear and the project completed by the addition of a new treble bell. We were delighted to welcome the Bishop of Chelmsford to a special service to rededicate the bells on All Saints Sunday, and the bells are now rung regularly for Sunday services and on practice night (Wednesday). Don’t go to the Gym for your workout - come to our belfry! Bells are the largest and loudest musical instruments in the world and are the perfect way to get gentle physical exercise. In our English climate, they are also a good way to be more active without getting cold or rained upon! As a bonus, bell ringing is open to everyone from 9 to 90 years of age. If you can ride a bicycle, you can ring a bell! Is a social activity and therefore FUN! If you are looking for gentle exercise, learning a new skill, and making new friends, come along to All Saints Theydon Garnon at 7.30 p.m. on any Wednesday evening and have a no-obligation cost-free try. There is ample parking and the postcode is CM16 7NX, or make contact through our 'Contact Us' page.